Thanks for reading past that thunderingly obvious title, but I’ve just spent a couple hours looking over some issues of The Dial and I’m reminded of how terrific and interesting it was. Is it possible to say that The Dial is under-appreciated in the world of modernist magazines? On the face of it, what a ridiculous claim. The first publication of The Waste Land and the poetry prize that accompanied it have insured the magazine a lasting fame (or notoriety, depending on your p.o.v. ), but I wonder if it suffers from that fame–so it’s regarded only as the magazine that published Eliot’s poem. It deserves to be read for more than that. It deserves to be read, and not simply from the position of historical research. It deserves to be read in the same way we read To The Lighthouse or The Good Soldier. Consider the July 1922 issue alone. 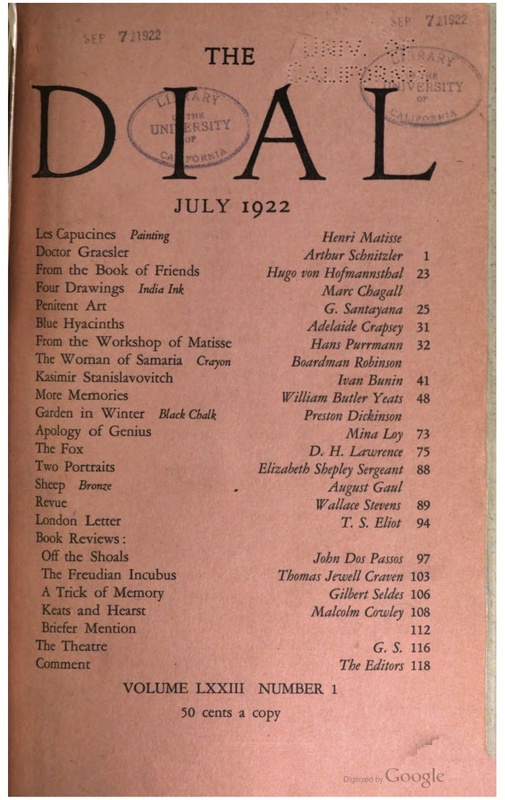 It contains a John Dos Passos review of e. e. cummings, a whole sequence of Wallace Stevens poems from Harmonium, an installment of a serialization of D. H. Lawrence’s The Fox, Mina Loy’s “Apology of Genius,” a long autobiographical piece by Yeats, and several more articles and images. It would be easy to spend a couple weeks in a course on this one issue alone, and everyone would likely emerge with a more finely textured sense of the diversity of modernism in 1922. But don’t read it in the service of understanding something else–read it because it’s great reading. See the issue here, where you can also download a pdf of the complete volume, including the advertisements. The Burlington Magazine is one of Britain’s oldest monthly art-historical publications. Founded in 1903 by a group of art writers that included Robert Dell, Roger Fry, Bernard Berenson and Herbert Horne, its aim was to cover all aspects of the fine and decorative arts, to combine scholarship with critical insight and to treat the art of the present with the same seriousness as the art of the past. Sotheby’s Institute of Art in London was founded by Sotheby’s auction house in 1969. It is now an independent not-for-profit institute and offers six MA programmes across a range of visual art disciplines and art business, together with semester and summer courses. These are validated by the University of Manchester with whom there is also a joint PhD programme. Research and teaching at Sotheby’s Institute focuses on the art work and its context within the framework of the art world and market. The aim of the joint conference is to explore how the international press, via art-historical writing and criticism in magazines and journals, has intersected with the reception and understanding of art, collecting, the art market and the teaching of art history. Preference will be given to submissions based on art publications from the twentieth century, although proposals outside of this time period will be considered. Papers should be no longer than 20 minutes. Please send proposals of no more than 250 words by 30th September 2012 to Anne Blood (conference@burlington.org.uk). For more details, see the Burlington Magazine website.